How much a person has in assets, including savings accounts, can sometimes affect the person’s eligibility for government aid and their ability to effectively plan for the future. This can be especially troublesome for people with disabilities, or for parents or guardians of children with disabilities who are organizing their estate plans with a goal of providing for the child in the future. One sometimes overlooked method of setting aside funds for future use by a person with a disability is the use of an ABLE savings account. ABLE stands for Achieving A Better Life Experience, and refers to the law that allows these tax free savings accounts to be set up to be used for living expenses. ABLE accounts are also referred to as 529A accounts, and are similar to 529 college savings accounts. The money that is saved in an ABLE account is saved tax free and can be used without penalty if it is spent for the purposes allowable under the law. Money saved in ABLE accounts can be used to pay for expenses related to housing, transportation, medical assistance, aides and other such expenses. Different states, including Florida, have set up ABLE accounts with investment options. Some states restrict their state ABLE accounts to residents while others allow out of state residents to open accounts. When considering which state to open an account in, the fees associated with the account should be considered. In order to qualify for an ABLE account, a person must have been blind or disabled before the age of twenty six years old. Individuals are also limited to one ABLE account, and the account can be funded with up to $14,000 annually. While the contributions to the account are not taxable, the earnings made through the investments of the contributions can be withdrawn tax free for qualifying uses. Once the account is set up, anyone can make contributions to the accounts, as with a 529 college savings account. This presents a great opportunity for family members and friends who want to assist or make contributions as gifts. Perhaps one of the best features of an ABLE account is that is can be funded up to $100,000 dollars without affecting the account beneficiary’s eligibility for government benefits such as Medicaid and Supplemental Security Income or SSI. ABLE accounts can be used to supplement these government programs, and therefore ensure that the beneficiary of the account is well taken care of, and will not have a shortfall. For older adults or people who develop a disabling condition after the age of twenty six, there are other estate planning tools that can be used to ensure that the person is provided for in the future. While they may not be as advantageous as an ABLE account in some cases, they still provide some good options to address a person’s needs. 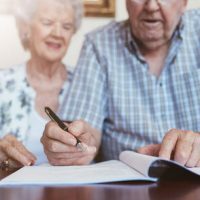 For more information on ABLE accounts, special needs trusts, trust administration and the best way to handle the legal aspects of estate planning with a person with disability in mind, contact an experienced estate planning attorney in The Villages, Florida by calling the Millhorn Elder Law Planning Group.